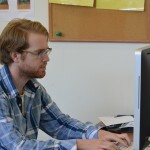 I’m William Repetto, a second-year graduate student at Villanova University. 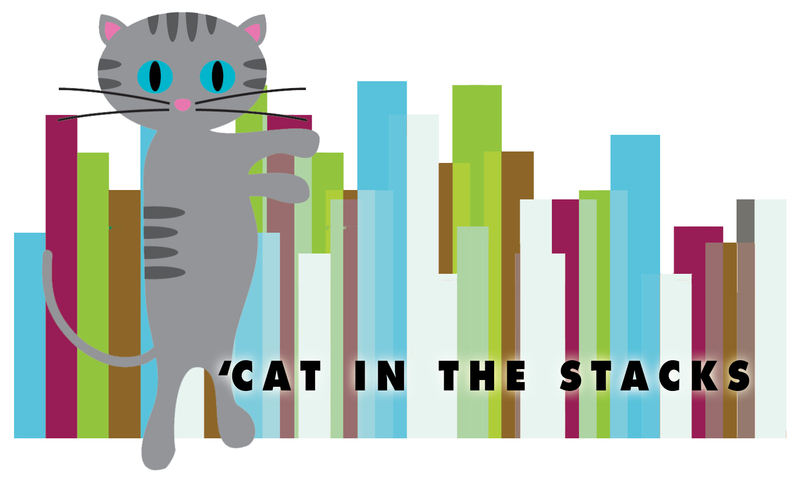 This is the “‘Cat in the Stacks” column. I’m your ‘cat. 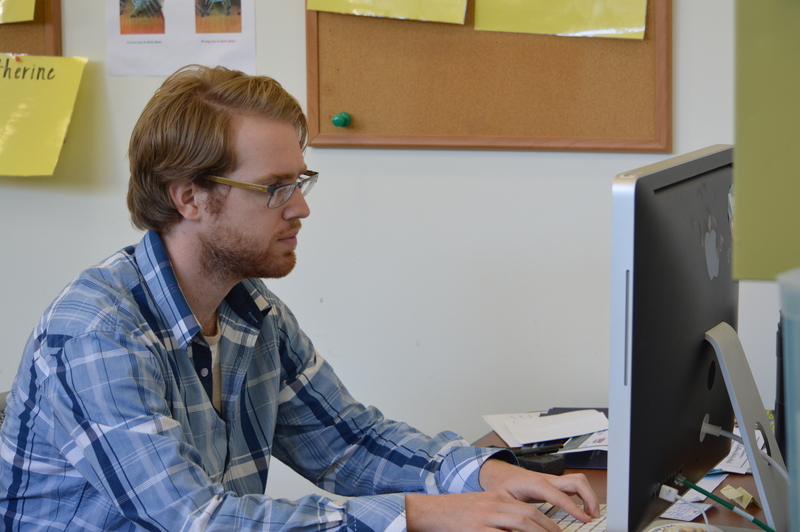 I’ll be posting about college life, about learning and growing here at Villanova, and, of course, about the Falvey Memorial Library’s role. 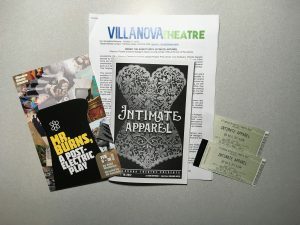 First you got an anecdote about kissing, then you got some dating advice, and now on this week’s ’Cat in the Stacks you’ll hear a thing or two about “Intimate Apparel.” I’m speaking, of course, of Villanova Theatre’s production of the famous play by Lynn Nottage. 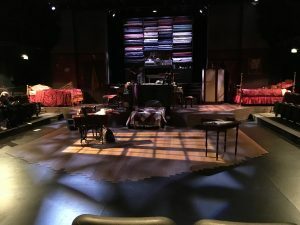 You might be familiar with my reviews of “Little Women” and “Godspell,” and, in true VU Theatre fashion, “Intimate Apparel” did not disappoint. 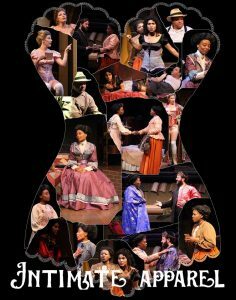 “Intimate Apparel” greets the audience with the sights and soundscape of early 20th-century New York City that dramaturg Andrea Rumble-Moore writes so lucidly about in the program. Along with the costume design of Janus Stefanowicz, and the rest of the costume department, the mis en scene of the play’s opening transport the audience a couple hundred miles north and a little over a hundred years back to 1904-1905 lower Manhattan. What greets us there are the marvelously depicted Esther (Sisi Wright), a seamstress of corsets and the like, along with her patrons Mrs. Van Buren (Kara Krichman) and Mayme (Alexandra King), and her landlady Mrs. Dickson (Marissa Kennedy). Did I mention her fabric supplier and secret admirer Mr. Marks (Nikitas Menotiades)? Only the highest forms of drama ensue as the illiterate Esther forms an epistolary romance with a Panama Canal construction worker named George (Brishen Miller). VU Theatre’s rendition wonderfully highlighted the complicated matrix of race, gender, and religion that complicated all social interactions of Greenwich Village in the early 1900s. As Esther struggles to identify with the lifestyles of her customers, she relies on them for both patronage and their ability to write to George. Most scene transitions are dictated by her letter-based romance, as the VU Theatre characteristically blends plot with the demands of technical theatre. As the story unfolds, however, George turns out to be someone vastly different than expected; an untimely kiss disrupts things quite a bit, and you might find yourself looking for a smoking gun – or shall we say a smoking jacket? Amidst the strong bonds that form between our female characters, you might find yourself wondering if all the characters use the term “gentleman” ironically, or if it’s possible to use it any other way. In the end, though, you’ll remain curious about why the modern world has found it possible to connect oceans across continents but cannot seem to find common ground among genders, races, and religions. The “Intimate Apparel” Stage as it greets the audience. The women of “Intimate Apparel” provide such a strong performance that you’ll notice they don’t even need any men to perform the set changes! As a follow up to “Godspell,” “Intimate Apparel” demonstrates the amazing range that the performers of the Villanova Theatre program really have. In no character is this more apparent than Mrs. Dickinson portrayed by Marissa Kennedy. Kennedy mixed wit and humor in “Godspell,” but, as Mrs. Dickinson, she returns as the wise and wry landlady that truly allows her to demonstrate the sheer breadth of her acting repertoire. Alexandra King, who we didn’t see in “Godspell,” returns to the stage in “Intimate Apparel” as Mayme – the entertaining yet introspective prostitute who receives all the same clothing as her upper-class double Mrs. Van Buren, played by Kara Krichman. A notable line delivered by Esther (Sisi Wright) about these two characters goes: “What she got, you want, and what you got, she want.” Well, King’s and Krichman’s performances certainly leave the audience wanting nothing more. Wright herself demonstrates the scope of emotions required to play such a layered character as Esther. Throughout the play, the audience sees her at different times as confident, shy, industrious, foolish, flirtatious, and downright serious. She handled each and every one of these emotions in stride and perfectly illustrated the complexity of the character for the audience. The press packet for “Intimate Apparel,” replete with an advert for “Mr. Burns” – which we sadly must wait until February to see! The script for the show, SPOILER ALERT – obviously. ANOTHER review of its off-broadway run. Whether you’re the bookish type enough to read these library resources or not, I hope you’ll still find your way over to the VU Theatre for a showing of “Intimate Apparel.” Showings will be at 8pm on Nov. 8-11 and Nov. 14-18; and showings will be at 2pm on Nov. 12 and Nov. 19.